The first book to show parents how to tell whether a child has a speech delay or a more serious speech disorder. Every parent eagerly awaits the day his or her child will speak for the fist time. For millions of mothers and fathers, however, anticipation turns to anxiety when those initial, all-important words are a long time coming. Many worried parents are reassured that their child is “just a late talker,” but unfortunately, that is not always the case. Co-author Lisa Geng was one of those parents and she discovered that her children had serious speech disorders. Marilyn Agin MD is the medical director of the Early Intervention Program in New York City. Lisa Geng is the founder and president of Cherab, a nonprofit organizations dedicated to children with speech difficulties, and co-founder of Speechville. She lives in Florida. Malcolm J Nicholl is a former international journalist, and co-author of The LCP Solution. He lives in Del Mar, California. One of the most important milestones in an infant’s life is the uttering of the first recognizable word. Obviously, not all children develop at the same pace, but most infants can be expected to say “mama” and “dada” sometime between the ages of twelve and fifteen months. As these dates pass and months go by, a child who remains silent can turn eager anticipation to anxiety and fear for the parents. More often than not, the child is simply a “late talker,” but in some instances the child may suffer from a speech disorder such as apraxia, a neurologically-based impairment that needs to be identified and treated as early as possible. • A detailed review of an intriguing nutritional supplement that has achieved promising results in helping late talking children. The Late Talker approaches the problem from the perspectives of a mother and a doctor. Lisa Geng’s son suffered from apraxia, and this led her to Dr. Marilyn Agin. Together, they present a balanced book, filled with resources, easy-to-read charts, a glossary and an index. 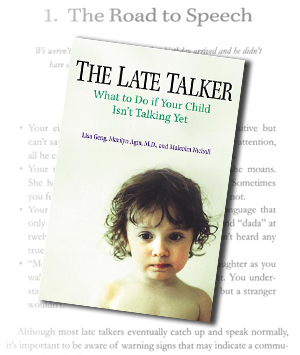 The Late Talkeris the first book to show parents how to tell if a child has a speech-delay—or a more serious disorder—and just what to do about it. Please Send Two Tearsheets Of Any Reiew or Mention. • Speech and language disorders are the number one developmental impairment in children under the age of five. • Fourteen million Americans have a speech or language disorder. An estimated 15 to 25 percent of young children and approximately 46 million Americans have some kind of communication disorder (including hearing problems). • Speech and language disorders are the leading cause of academic failure and emotional distress. • Communication disorders cost the United States $30 billion a year in lost productivity, special education, and medical expenses. “Oral language—the ability to communicate needs, feelings and opinions via verbal speech—is the coin-of-the-realm in today’s society. One must be able to interact verbally with others and an inability to do so, can greatly hamper a child’s development and independence. For most children, oral language develops quite naturally. As the child’s vocabulary and syntax emerges, he becomes better able to communicate with others and gains control of his environment. A child’s failure to develop normal verbal language can create great angst for his parents and caregivers. When a parent has concerns about the child’s language development, she often turns to family members or neighbors for ‘expert’ advice. The counsel that is provided generally ranges from unwarranted panic to laissez-faire advice that the child ‘will grow out of it.’ Neither of these reactions is particularly helpful or effective. However, The Late Talker by Agin, Geng and Nicholl provides useful, field tested advice for parents who are concerned about their child’s language development. This gem of a book provides an immensely readable overview of normal language development and a thorough review of the cause of language delays and disabilities. The material offers comfort and counsel for the anxious parents. The great strength of The Late Talker is its transdisciplinary approach to the topic. Dr. Agin offers a thoughtful medical perspective on the problem and translates the related research into understandable and useful terms. Co-author Lisa Geng provides an invaluable parental perspective on the issue by discussing the emotional reactions of the family to the child with delayed speech. .. are coming in from the people who matter most–parents and grandparents of children with speech disorders. Dr. Marilyn Agin and Lisa Geng provide a formidable partnership. Together, the medical specialist and the concerned-mother-turned–passionate-children’s-advocate write from a unique perspective. Prior to medical school, Dr. Marilyn Agin received her master’s degree in Communication Disorders and was a practicing speech pathologist treating children and adults. She then went on to medical school, and completed a combined residency in Pediatrics and Physical Medicine and Rehabilitation at New York University Medical Center and the Rusk Institute. She is board certified in both fields, and in neurodevelopmental disabilities. After residency, Dr. Agin worked at Children’s Specialized Hospital, a premier children’s rehabilitation center, in Mountainside, NJ. There she was in charge of the pediatric spinal cord injury program and performed neurodevelopmental evaluations for infants and children with developmental disorders. After several years at the Hospital, Dr. Agin left to join a private practice in General Pediatrics and to continue performing neurodevelopmental evaluations. As a practicing pediatrician, Dr. Agin was a keen observer of normal development during the well visits for young patients. She would often identify children with speech and language disorders, including apraxia of speech, neuromotor delays, sensorimotor dysfunction, and children on the autistic spectrum. She currently is the Medical Director of the Early Intervention Program in New York City, maintains a private practice. She is passionate about early referral for developmental delays and disorders and has lectured to pediatricians and participated in numerous workshops on developmental surveillance, screening and assessment. She is a member of the New York City Chapter of the Committee on Children with Disabilities and a member of the of the Executive Council of the American Academy of Pediatrics. In November, 1998, Dr. Agin was cited as a “Top Doc” in Physical Medicine and Rehabilitation by New Jersey Monthly. Dr. Agin is married and is the mother of teenaged twins. Lisa F. Geng is the mother of two “late talkers” and the founder and president of Children’s Apraxia Network, a non-profit organization for children with neurologically based language disorders. Within a year it became the biggest organization of its kind. More recently, she started the CHERAB Foundation (Communication Help, Education, Research, Apraxia Base), a partnership of parents and professionals working together to provide support and information for anyone who cares for children with speech challenges/apraxia. Lisa commenced her crusade as the result of the personal challenges she faced with her two young boys, now aged four and six. As a baby, the prognosis for her older son was severe as a result of birth trauma that caused torn and crushed muscles and nerves in his head and neck. He is now mainstreamed and doing extremely well at school. Her second son has apraxia, and because of early intervention and appropriate therapy, is also doing well. Both required Lisa’s active role as a parent and early intervention to achieve such success. Lisa is the creator of ShopInService.com, a philanthropic company that offers free shopping to assist those who can’t shop for themselves. Lisa Geng is also a multi-talented creator and inventor with twenty years experience in the children’s market place. Her successful inventions cover a variety of fields ranging from children’s toys and medical products, to services. Her children’s toys include “Roll over Rover,” manufactured by Mattel/Fisher-Price, and “Pretty-Up Pony” (Empire/Marshon). Lisa has worked as an art director for companies such as Warner Bros. and Disney. Lisa created the characters for—and wrote—three animated “short” movies currently being shot by noted producer and director Frank Drucker. These movies raise awareness on how to help keep our children healthy, happy, and safe. It’s a project that has already received preliminary endorsements from government, educational, and medical professionals. Malcolm J. Nicholl is a former international journalist whose career included a two-year stint as Belfast bureau chief for the London Daily Mirror. He has written extensively on nutrition and education subjects. His most recent book, The LCP Solution: The Remarkable Nutritional Treatment for ADHD, Dyslexia and Dyspraxia , co-authored with Jacqueline Stordy, Ph.D., was published in September 2000.